At the heart of the national infrastructure, Apollo Birmingham provides express delivery sameday and timed nextday services. We operate a fleet of dedicated liveried small vans, transits and motorcycles serving many of Birmingham’s most respected blue chip companies, government bodies and of course our local small businesses. We have achieved rapid expansion over the last twenty years through applied technological investment enabling detailed tracking and route planning, giving you the most reliable secure method of delivering urgent consignments locally, nationally and internationally. Apollo take great care in recruiting and training the best possible staff to ensure the highest level of customer service whilst maintaining and building a personal and trusting relationship with our clients. 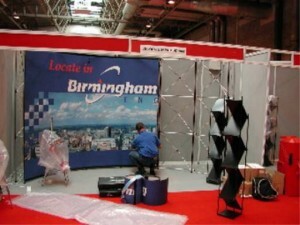 Apollo Birmingham also store, deliver and erect exhibition material on demand both home and overseas, here is an example being built for Birmingham City Council. As part of a national network of Apollo offices, Birmingham is able to offer businesses at the heart of the country the ideal solution to their express delivery needs wherever they may be. Nick, Phil and Deb are waiting for your call.